Traces the life of Lisa "Left Eye" Lopes, from her difficult childhood, to her stardom with the popular group TLC, to her premature death in an auto accident. Nancy Krulik is the author of more than 150 books for children and young adults, including the New York Times best-seller Leonardo DiCaprio: A Biography. Her long list of biographies includes books about Hilary Duff, Raven, *NSync's J.C. Chasez, and the late TLC rapper Lisa Lopes. Nancy has appeared as a guest expert on several celeb-focused TV shows including Access Hollywood, Extra, and E! Love Chain. She lives in Manhattan with her husband, composer Daniel Burwasser, and their two children. This book was good. However as some one mentioned the author did make some mistakes. She left out two of Lisa's guest appearances in the back of the book. 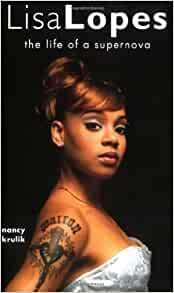 1997 Nothing to Lose Soundtrack - "Not Tonight(remix)"- Angie Martinez, Lil' Kim, Da Brat, Left Eye and Missy Elliot. I don't know how you miss that record since it was such a hit. Not only that she missed another guest song from 1997 off of Will Smith's cd "Big Willie Style". The fifteenth song was titled "Big Willie Style" and it featured Left Eye. I was very surprised that the author missed these important songs. I mean they were major songs that Left Eye did , I don't know how she missed them while doing her research which leaves me to believe that she is not a Hip-Hop & R+B fan, cuz I'm sure a lot of people know about these songs. Left eye's legacy will live on throughout the pop culture based on her inspirational, innovative, and talented work with TLC.